Elegant with a hint of old fashioned charm, this fully furnished four bedroom, four bathroom, 5,412 square foot home offers a range of possibilities to potential buyers. Located in the prestigious Port Royal community, this home is the perfect winter getaway or can be used as an income-generating property for seasonal renters. Close to shopping, dining, and beautiful beaches, this home is the perfect Naples retreat. The front elevation is a beautiful take on the classic East Indies style commonly seen in and around Naples. As you pull through the circular driveway, the classic look of the siding and dormer windows welcomes you home. The large front door is sheltered under the peaked porch and offers a familiar and comfortable aesthetic. Established landscaping gives the home a local flavor. Through the front entry with its tall ceilings and whitewashed stairs, lies the formal living room. Large windows and vaulted ceilings provide plenty of drama while wood beam details in the ceiling warm the space. The room is accented with a palette that includes pops of red with coral undertones and wood accents. The comfortable family room is made cozier by a fireplace with brick and traditional mantle. Painted wood panels flank the fireplace and create two nooks perfect for art or seating. Hardwood floors are a warm base for the family room, as well as the other first floor rooms, and French doors lead to the pool beyond. The kitchen features a gas range and plenty of storage. White cabinets keep the kitchen clean and traditional. Stainless steel appliances and a large amount of counter space make this a great place to host seasonal gatherings and family dinners. The master bedroom with ensuite bath offers plenty of room to relax and unwind. The large room is washed in natural light thanks to the array of large windows and french doors. It also features a sitting area with private balcony. 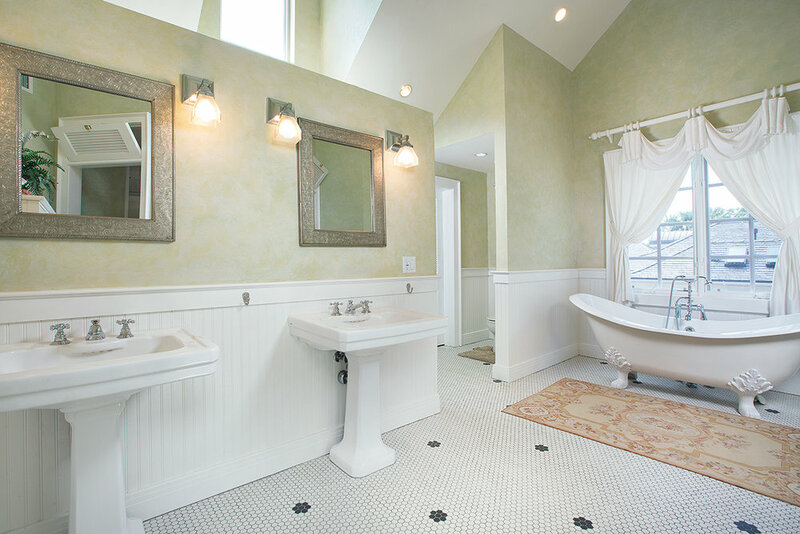 Traditional penny tile floors with black details create a stylish foundation for the master bath. The pedestal sinks and clawfoot tub add to the charm of this bathroom and are consistent with the theme of the rest of the home. Tall ceilings with transom windows keep the room light and bright. The pool and spa area is lushly landscaped with mature trees and vegetation. The beautiful curves of the custom pool compliment the natural setting the manicured lawn provides. Around the pool there is a wonderful deck for sunning while a stone waterfall provides a relaxing soundtrack. For easy outdoor entertaining, there is an exterior kitchen and dining area. For sale for $4,375,000, this home is a wonderful Port Royal option. Call Olde Naples Real Estate at 239-262-2252 for more information.